UPDATED: Sun., Sept. 3, 2017, 11:36 p.m. Growing up as a huge baseball fan in the Heartland during an era when a couple of Brett brothers with Spokane ties played for my beloved Kansas City Royals, the only thing more certain than pine tar was the postseason. Nothing was better than September baseball, because those games meant something. The boys of summer almost always brought fun in the fall. Well, let’s just say that a nearly 30-year playoff drought and a few too many 100-loss seasons will teach you a few things about being a faithful fan. You can’t imagine how much bad baseball I subjected the little Curley kids to in the name of Royalty Loyalty. More important, it teaches you to appreciate going to the ballpark for a game that matters when the leaves are starting to change colors. How does that cheesy, but totally awesome hair-metal ballad from the ’80s go? You know, the better tune would probably be that Earth, Wind & Fire classic. And Sunday night at Avista Stadium was what I craved. I wasn’t alone – 6,307 others felt the exact same way. A make-or-break, must-win game to close out the regular season against the Everett AquaSox will do that. That and the promise of fireworks. We really do love our baseball with some fireworks here in Spokane. The patriotic bunting around the nearly sold-out stadium – even if it was still up from Military Night a few games back – made it look like a playoff atmosphere. There was a huge moon, as yellow as you’ve ever seen, directly above the Avista scoreboard. The players stood at the top step of the dugout for the entire game. You just felt like something cool was going to happen, even after Spokane gave up two home runs in the first inning. Then the Indians gave us the type of diamond pyrotechnics you dream of in a game like this – a walk-off in extra innings. 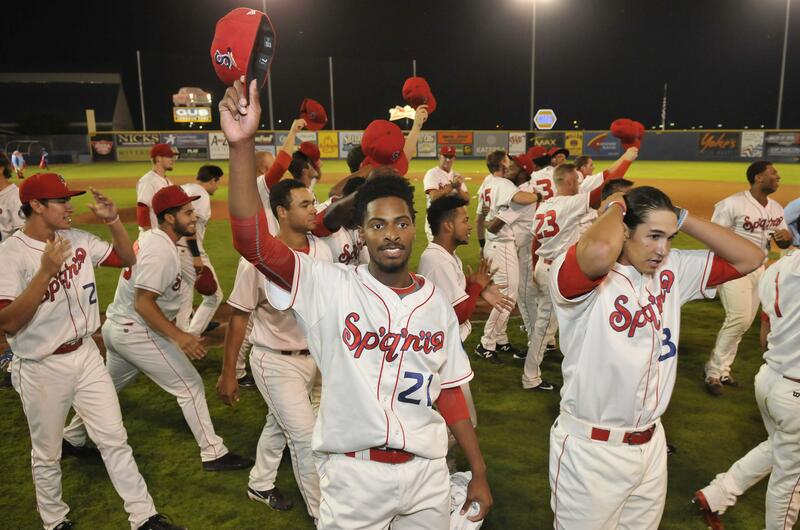 It was the perfect bookend to a regular season that saw Spokane go from worst to first. Literally. The Indians finished the first half of the season in dead last – at one point, losing eight straight. They ended it as the second-half North Division champions, headed to the playoffs. And they did it in the total cardiac-kid fashion that has marked the team’s last several weeks. Twenty of the Indians’ last 33 games have been one-run games, including winning 11 of the last 13 one-run games. No one affiliated with the team or the league can remember there ever being a stat like that. The team’s pitching has been amazing to watch over the last half of this season, including 13 strikeouts on Sunday – making this newspaper’s investment in The Spokesman-Review “K-Cards” one of the most economically responsible promotions our accountants have ever seen. Lots of people saw our “K-Cards” this year at Avista Stadium. The Indians drew 196,653 fans, breaking the team’s previous short-season attendance record. It was actually a historic year for crowds, as the team averaged more than 5,300 a game this summer, making it the largest per-game attendance in Spokane baseball history, dating back more than 110 years. It was a year when the team’s iconic Salish jersey was honored in Cooperstown. And the leader of the Indians’ adored grounds crew was even at Major League Baseball’s All-Star Game in Miami to help make that field look as beautiful as ours does here in Spokane. Then there was the Redband Rally. Yep, the team added a colorful local fish to its arsenal of mascots and then sold more hats with a trout on them than you could possibly believe. Whether the players actually believe in the power of the Redband Rally or not doesn’t matter. More than 6,000 people on Sunday did. When the game was over, you saw something you don’t see at many professional baseball games. The players all stayed on the field to watch the fireworks exploding over the top of center field. Just like the fans behind them. Arms around each other. Still cheering. Posing for photos. And then another perfect song started playing over the Avista P.A. system. That’s why you cherish September baseball. It’s the stuff you never want to forget. Updated: Sept. 3, 2017, 11:36 p.m.